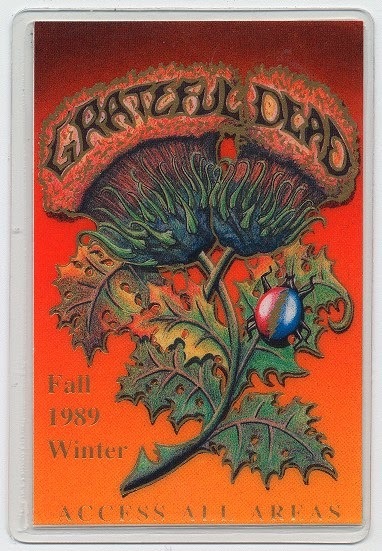 In this edition of 'Now Playing', I have spinning the second set of the Grateful Dead's October 26th, 1989 performance in Miami, Florida, the final stop on their Fall 1989 tour. After the unique and well jammed pairing of the second set openers 'Estimated Prophet' segued into 'Blow Away', the band plays the last version of 'Dark Star' of that tour. Following its break out in Hampton, VA a bit over two weeks prior on October 9th after a 5 five year absence, the band then played two more versions of the song on the tour. The next in New Jersey on the 16th and the subject of this 'Now Playing' in Miami on October 26th. Many Deadheads believe these to be the best late era 'Dark Stars', never to be equaled over the last six years of the bands career. After enjoying the 10/16 'Dark Star' (Available of 'Nightfall of Diamonds' CD) and the break out on the 9th (Available on 'Formerly the Warlocks' Box Set) I really find the 26th to hold the gold. After years of mind expanding and boundary stretching versions from 1968-1974 of 'Dark Star', the band found that their glorious tool to access secret realms of improvisation had become stale. The song could no longer offer the transformational doorways so accessible to the musicians in the past. From 1978 to the 'Dark Star' breakout in 1989, the band would only play the song three times, with the three versions in my opinion paling in comparison to the versions preceding it. The Fall 1989 versions initiated by the new MIDI effects units that the group had introduced in the Spring revealed an enlivened and refueled 'Dark Star' with fresh avenues for exploration. 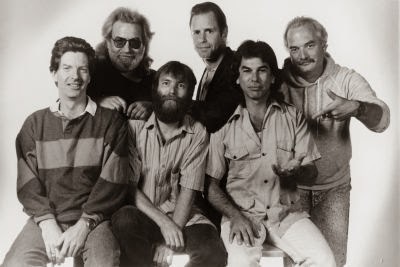 There is a consensus that from Spring 1989 until Brent Mydland's untimely death after the 1990 Summer tour that the Grateful Dead had a achieved a renaissance, never again to be reached before Jerry Garcia's death in 1995. Multiple factors including but not limited to Garcia's renewed health, the bands new found popularity, as well a new found camaraderie and consistency in the band equated to a tour that reached new and exciting heights. 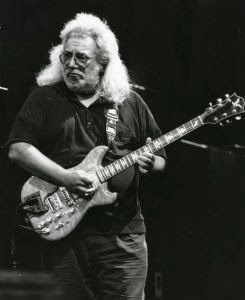 Garcia also returned to his beloved 1970's guitar, 'The Wolf', outfitted with a full MIDI exploration hook up. The tour was brimming with song breakouts and extended improvisations none more impressive than the return of 'Dark Star' The version on October 26th the final of three, is arguably the best and the one I am enjoying, although all of them offer unique moments deserving of inspection. What makes the version of 'Dark Star' from Miami worthy of review is its wealth of new exploratory ideas unearthed do to the advent of a new sound arsenal and confidence. The preceding Hampton version is similar in its expansive qualities as well as set placement. The Meadowlands version I feel suffers a bit from being split between pre-drums and post-drum in the second set. The 'Playin' from that Meadowlands concert appears to hold the majority of special jamming prior to falling into drums, a common occurrence for this era. This Miami 'Dark Star' is played as one piece prior to drums and space and is played with a concentrated focus similarly to pre-retirement versions. The song would soon return to the groups song rotation in various guises following these break outs, but in my opinion never mining the rich psychedelic veins of these Fall 1989 performances. After an extended spacy tuning break, the band opens the mossy ancient door of 'Dark Star'. After settling into a dreamy pre-verse jam Garcia quickly sings the first verse, standard for these three October versions. By two minutes and following a squealing feedback statement by Weir, Garcia sings verse one in a tour worn rasp,ragged, but still soulful. When the first verse is disposed of the group eagerly, the band pops into a jazzy excitable groove with the drummers in particularly wonderful form. Garcia scrutinizes the theme with a shimmering tone that leaves a trail of glitter across the rhythm section. Brent inserts well timed glissando's as the band pushes anxiously.. At half past four minutes Lesh thumps a series of low sepulchral notes that initiate the group to veer down a barely visible and secluded path. Lesh is very active and Garcia follows, now with a clean tone disassembles the band, the knot loosens and the drummers up the ante. At close to six minutes there is an old school 'Live Dead' mini melt, the group mind begins to coalesce into one organism. Weir contributes skid mark interjections, Hart drops in multiple percussive emotions, and Garcia endlessly accepts and rejects cosmic guitar melodies. At half past six minutes, approaching seven the bottom drops out and Garcia becomes a hollow woody horn, then a scurrying multicolored video game character. Garcia starts to throw multifarious riffs against the wall to see what sticks while the drummers keep the jam bobbing above water. At eight minutes the martian flute tone materializes for Garcia. Lesh and the drummers induce an erratic dance while bearing cavemen clubs. The central orbit of 'Dark Star has been reached, the band caresses the muse and at half past nine create a series of rotating concentric mandalas. The heart of the jam has been found, fluttering planetary anomalies rush by while the music becomes colorful and waxy, with the band feeling the space for extended riffing. The groove slithers dynamically and beautifully with Garcia zoning out, only stopping to admire the sonic horizon that starts to coalesce as the second verse comes into distant focus. A sweet 'Dark Star' themed jam hits the spot as Garcia sings the slightly flubbed second set of lyrics. After the verse the band anxiously and immediately falls into deep space improv. Garcia uses sizzling distortion and then muted tones against Mydland's crazy house piano lines. The space becomes clustered with woodland flutes, a chiming series of bells and pitch bending keyboards. Lesh starts to lay a foundation down coaxing the group into stacking stones on top of the slowly pulsing hand drums. Weir hits on a hot riff, Lesh is all over the fret board, static forms, Hart gets strange, Mydland starts to assert himself with massive pieces of found piano sound. Comedic car horns and confused panning of the stereo image create insanity as the jam peaks suddenly then languidly evaporates into drums. Weir, Mydland are the last to leave the stage to the drummers, conjuring a fragmented prelude to drums. This particular performance is a flashback to 'Dark Star's' of years past. Years of the huge two verse variety, where time was of no issue for the band. Regardless of your feelings about the incorporation of MIDI into the bands sound, on this particular evening everything comes together to create a magical series of improvisations. The drummers are playing particularly well, pushing the band even when they deconstruct into free space. Garcia's 'Wolf' guitar is a glorious psychedelic horn, navigating the aural jelly of the grooves created. The song would appear again on New Years of 1989 and then stick around the bands song list for the next few years. Always a special and hoped for performance, this Fall 1989 version is the greatest of the three performed that October, and in my opinion the best late era version. Pick any Grateful Dead performance from October 1989 and you are bound to find a moment of pure bliss for your own 'Now Playing'.